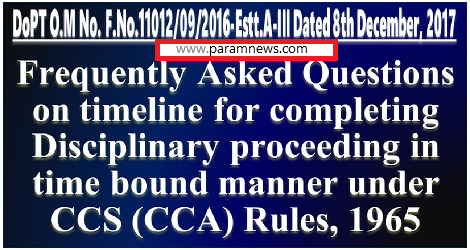 Subject: Frequently Asked Questions on timeline for completing Disciplinary proceeding in time bound manner under CCS (CCA) Rules, 1965. Instructions have been issued in the past for expeditious disposal of disciplinary proceeding cases. Further, Central Civil Services (Classification, Control & Appeal) Rules, 1965 have also been notified vide Gazette Notification No. 548(E) dated 2.06.2017 (copy enclosed) for introducing stringent timeline for completing disciplinary proceeding in a time bound manner. Based on the same, a set of frequently asked questions is attached for necessary information. 2. Ministries/ Departments are requested to bring the contents of this O.M. to all concerned for compliance. Question: What is the time limit for charged officer to submit his written statement of defence on charge sheet? Question: What is the time limit for producing requisite documents claimed by charged officer during? Answer: Sub rule (13) in Rule 14 provides for producing the documents or issue of non-availability certificate within a period of one month of the receipt of such requisition. Question: What is the time period for the Presenting Officer to produce the evidence by which he proposes to prove the articles of charge if the Government Servant fails to appear within the specified time or refuses or omits to plead? Question: What is the time period for inspecting the documents produced by Presenting Officer for the purpose of preparing his defence? Question: What is the notice period for production of any documents, which are in possession of Government but not mentioned in the list of documents served with the charge sheet but a request in this regard is made by the Charged Officer? Question: What is the time limit provided for adjournment before close of the case for Presenting Officer to produce evidences not included in the list given to Charged officer or Inquiring Authority himself call for new evidence or recall and reexamine any witness? Question: What is the time limit for completing the inquiry and submit report by Inquiring Authority? 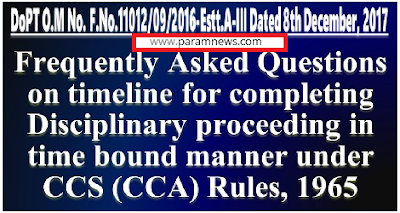 Question: Whether time limit of 6 months decided vide notification dated 02.06.2017 is also applicable to cases where Inquiring Authority was appointed prior to the 02.06.2017? Answer: Yes. Ideally such cases should have been completed, as per the time limit prescribed in the said notification, if those cases are still pending, the period of six months for completing the inquiry can be reckoned w.e.f. 02.06.2017 and extension should be sought, if required. Question: What is the time limit for furnishing written representation by charged officer on the advice of UPSC? Question: What is the time limit for sending proposal to CVC for first stage advice? Question: What is the time limit to put up the case to Disciplinary Authority after receipt of first stage advice of CVC for taking a decision to initiate disciplinary proceeding? Question: What is the time limit to issue a charge sheet to Charged Officer once a decision is taken by Disciplinary Authority to initiate disciplinary proceeding? Question: What is the time limit for seeking representation of Charged Officer on inquiry report and disagreement of Disciplinary Authority, if any on it? Question: What is the time limit for seeking second stage advice of CVC, if required or to UPSC for their advice? Question: What is the time limit for concluding major penalty proceeding?